AMERICA-I-AM BLACK FACTS: The Story of a People Through Timelines, 1601-2000 | Dr. Quintard Taylor, Jr.
"Time is the great equalizer. No person, race, culture, or nation stands beyond its reach or can alter its inevitable progress." So begins Quintard Taylor's volume, America-I-Am Black Facts: The Story of a People Through Timelines, 1601-2000. Taylor's invaluable reference timeline chronicles the history of African America over more than five centuries against the backdrop of American and world history. The timelines allow the reader the opportunity to see the world not from our contemporary vantage point looking backward at what is now assumed was most important at the time, but instead to more accurately see the world as it appeared to those who lived in that era. 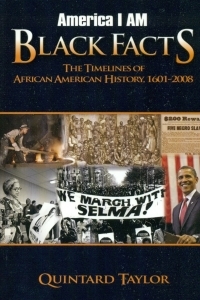 AIA Black Facts reveals the pivotal moments in the story of the forty million people of African descent in the United States, he unexpected relationships between people and events, and the often unrecognized causes and effects that created African Americans’ indelible imprint on our nation. It is also a starting point in the relationship of black Americans with the more than one billion people of African descent around the world.